Ainsley has been working in the field of beetle systematics and taxonomy since 2003, specializing in truffle beetles and the evolution of insect iridescence. Since moving to Australia in 2008, she has worked as a postdoctoral researcher at the Australian National Insect Collection (CSIRO) and as a research associate at the University of Sydney and the Australian Museum. 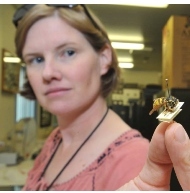 As the manager of DPI’s insect collection, she applies her entomological expertise to problems of biosecurity, rapid diagnostics, and agricultural systems. Ashman, Lauren and Seago, A. E. (A new genus of leiodid beetle from Australia, with key to species of Australian Agyrtodini and discussion of agyrtodine phylogeny (Coleoptera: Leiodidae: Camiarinae). Zootaxa. In press. Seago, A. E., Leschen, R. A., and Newton, A. F. (2015). Two new high altitude genera of Camiarini (Coleoptera: Leiodidae: Camiarinae) from Australia and New Zealand. Zootaxa, 3957(3), 300-312. McKenna, D. D., Farrell, B. D., Caterino, M. S., Farnum, C. W., Hawks, D. C., Maddison, D. R., Seago, A. E., Short, A. E. Z., Newton, A. F. and Thayer, M. K. (2014) Phylogeny and evolution of Staphyliniformia and Scarabaeiformia: forest litter as a stepping stone for diversification of nonphytophagous beetles. Systematic Entomology 40(1): 35-60. Seago, A. E. (2014) Book review: Australian Beetles Volume 1: Morphology, Classification, and Keys by J.F. Lawrence and A. Slipinski. Systematic Entomology 40(1): 288-289. Umbers, K.; Fabricant, S.; Gawryszewski, F.; Seago, A.; Herberstein, M. (2014) Reversible colour change in Arthropoda. Biological Reviews 89(4): 820–848. Seago, A. E. and Saranathan, V. (2012) Photonic crystals in beetles. In: Nature’s Nanostructures, A. Barnard and H. Guo, eds. Singapore: Pan Stanford. Pp. 313– 325. Seago, A. E., Giorgi, J.A., Li, J. and Ślipiński, A. (2011). Phylogeny, classification and evolution of ladybird beetles (Coleoptera: Coccinellidae) based on simultaneous analysis of molecular and morphological data. Molecular Phylogenetics & Evolution. 60:137–151. Lawrence, J. F., Slipinski, A., Seago, A. E., Thayer, M. K., Newton, A. F., and Marvaldi, A. E. (2011). Phylogeny of the Coleoptera based on morphological characters of adults and larvae. Annales Zoologici (Warszawa), 61 (1): 1–217. Yeates, D., Seago, A., Nelson, L., Cameron, S. L., Joseph, L., and Trueman, J. W. (2011). Integrative taxonomy, or iterative taxonomy? Systematic Entomology 36 (2): 209-217. Seago, A. E. and R. A. B. Leschen (2011). Revision, phylogeny, and biogeography of Chelagyrtodes Szymczakowski (Leiodidae: Camiarinae: Agyrtodini). Zootaxa 3090: 1–20. Xu, M., Seago, A. E., Sutherland, T. D., and Weisman, S., (2010). Dual structural color mechanisms in a scarab beetle. Journal of Morphology, 271 (11): 1300–1305. Seago, A. and Beutel, R. (2010). 11.15. Prostomidae G. G. Thomson, 1859. In: Coleoptera, Beetles. Volume 2: Morphology and Systematics, vol. IV of the Handbook of Zoology, N. P. Kristensen, R. G. Beutel, Eds. Berlin: Walter de Gruyter. Pp. 659-666. Chile, with generic key and species checklist of described Neopelatopini (Coleoptera: Leiodidae: Camiarinae). Annales Zoologici (Warszawa), 59 (3): 297– 304. Seago, A. E. (2009). Revision of Agyrtodes Portevin (Coleoptera: Leiodidae). Coleopterists Bulletin 63 (1): 1–73. Thomas, D. Seago, A. and Robacker, D. C. (2007). Reflections on golden scarabs. American Entomologist, 53 (4): 224–230. Seago, A. E. (2005). Male description and generic review of Agyrtolasia Szymczakowski, with key to genera of Agyrtodini (Coleoptera: Leiodidae: Camiarinae: Agyrtodini). Zootaxa 1103: 1–15. Seago, A. E. and Wheeler, Q. D. (2004). Two new species of Aglyptinus Cockerell with unusual sexually dimorphic antennae and diffraction gratings (Coleoptera: Leiodidae) The Coleopterists Bulletin, 58: 235– 244. Seago, A.E. and Lingafelter, S. W. (2003). Discovery of Crepidodera bella Parry (Coleoptera: Chrysomelidae: Alticini) in Maryland and redescription. Journal of the New York Entomological Society, 111(1): 51–56.